We face many complex challenges when it comes to a clean and healthy ocean, but one problem is simple to understand: Trash. We have some beautiful beaches around Pedasi and with a little effort we could become known for having some of the cleanest beaches in all of Panama. Unfortunately the tide and currents bring significant amounts of garbage ashore that is not from our area and there is little we can do about this. Focusing on things that we can do to make a difference is increasing the amount of garbage cans down at Arenal beach. Arenal is by far the busiest beach in the Pedasi area and of course the jumping off point to head out to the beautiful Isla Iguana. It is a very visible and important part of our community to both locals and tourists. It is obvious by the often over flowing bins that people are making some effort to try and keep the area clean. This is a good sign. We often see the garbage cans overflowing and we need to add additional bins with secure lids. To take this a step further would be the construction of a garbage shed / cage to keep all the trash secure in one area. This would eliminate the trash being spread back onto the beach and parking area from the birds, animals and wind. It would also provide one single area where everyone would know to bring their beach garbage and would make it more attractive than the present situation. We were very proud of the turnout we received from our beautiful community. Thank you to everyone that helped at our first of many beach clean ups. 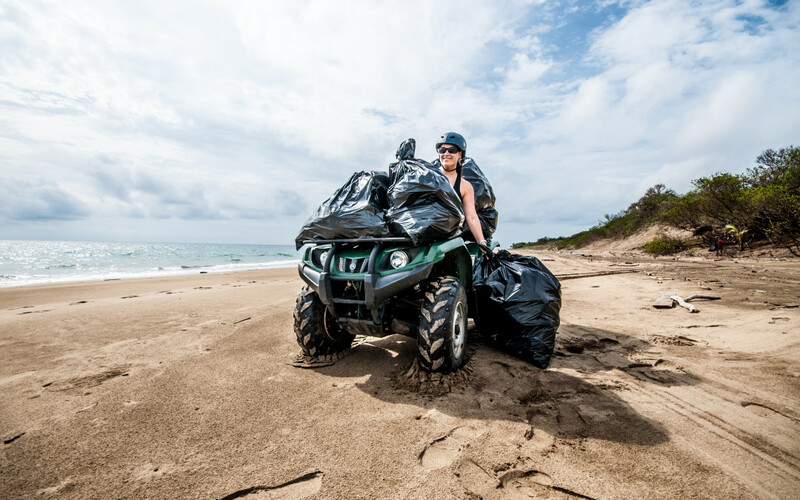 Within approximately 2 hours we were able to fill 2 pick-up trucks and create an area approximately 700 meters long of beautiful garbage free beach! What a great sight that was. Many of the participants also focused on the parking area and it really looked good. Afterward we were discussing how great it looked and how cool it would be if it looked like that all the time. I am certainly interested in anyone’s opinion or ideas on how we can keep our beaches beautiful. We are planning a similar thing when we arrive to our new home in Bocas, this September. How do the locals respond to your efforts? Don’t want to offend. The locals loved it as we had a large BBQ back at our place and let the kids use our pool. We got a lot of local businesses to donate some money or drinks for the BBQ and it was a great hit. We have done this again since and we had more locals show up. Getting the scouts involved too is a great way to educate the kids. How about an “adopt a beach program. Once set up, you could have competitions between beaches to see which one is the cleanest and most attractive that caters to basura receptacles being placed in and around the area. The receptacles could be 50 gallon drums painted in pretty colours by local artists to make them more visible or, as you know, all it needs is someone to move there that can see the value in re-cycling and that they can make money off garbage. Advertize it everywhere, some enterprising sold will come forward. How about the locals charging a deposit on all cans and drink bottles etc, having a deposit on them and when returned they get the deposit back. What’s wrong with someone setting up a bottle depot like the one’s we have back in Canada. It’s all good stuff and if we have a chance to talk about it when we stay at your place, we will. I look forward to discussing all these great ideas with you while you are here Ken. Looking forward to meeting you all soon.